Geolocation is the process of identifying the geographic location of an object such as a mobile phone or a computer. Twitter allows its users to provide their location when they publish a tweet, in the form of latitude and longitude coordinates. With this information, we are ready to create some nice visualisation for our data, in the form of interactive maps. GeoJSON is a format for encoding geographic data structures. The format supports a variety of geometric types that can be used to visualise the desired shapes onto a map. For our examples, we just need the simplest structure, a Point. A point is identified by its coordinates (latitude and longitude). In GeoJSON, we can also represent objects such as a Feature or a FeatureCollection. The first one is basically a geometry with additional properties, while the second one is a list of features. 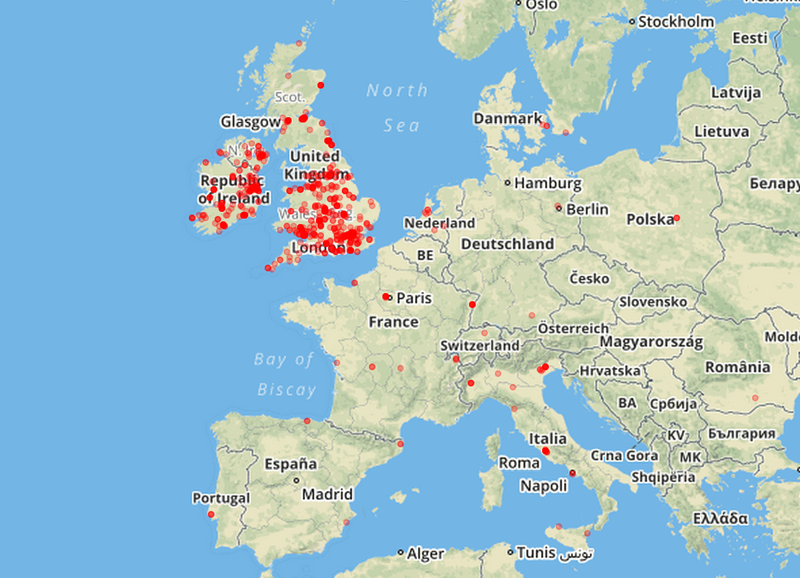 Our Twitter data set can be represented in GeoJSON as a FeatureCollection, where each tweet would be an individual Feature with its one geometry (the aforementioned Point). "created_at": "Sat Mar 21 12:30:00 +0000 2015"
Assuming the data are stored in a single file as described in the first chapter of this tutorial, we simply need to iterate all the tweets looking for the coordinates field, which may or may not be present. Keep in mind that you need to use coordinates, because the geo field is deprecated (see the API). # Tweets are stored in "fname"
The above example uses OpenStreetMap for the tile images, but Leaflet lets you choose other services. For example, in the following screenshot the tiles are coming from MapBox. Very nice article, thanks man! Where’s the code located? Do you have a github repository or something? Hi jonas, all the code you need to replicate the examples is embedded in the article. The data have been collected using the code from part 1 and the description of the data is on part 4. Within the past day, I streamed a 200 MB file of tweets containing #WT20 , which is an ongoing cricket tournament in Mumbai, however using these instructions only 54 tweets contained coordinates. That seems a bit low, any idea? Hi Nolan, this is quite on the lower end but not too far off compared to what I’ve observed with different data sets. i am unable to run the following part of the code. i am a noob when it comes to js. I want to start by saying that this is the most useful tutorial on Twitter mining that I have seen to date! Thank you! I only have one question. I don’t know if this is a coincidence or an error, but out of the roughly 2000 tweets, only two had valid coords. Both of these two coords were in places that I really don’t think are correct (All the way down by south pole, and in the middle of Somalia). Any indication as to why this may be happening? Hi Dane, the number of tweets with geo coordinates is often very low. With such a small data set, it’s possible to have very few useful tweets. This is a very helpful tutorial. Thanks so much. any advise? thank you so much! Even I am facing the same problem. Is there any solution? Any help on how to fix this is greatly appreciated. Many thanks. the problem seems very similar — let me know if it solves the problem. Thank you that appeared to work. However, after gathering 100mb of tweets over ten minutes using the keyword ‘Trump’ (wanted to gather a large volume of tweets so used this word). only about 10 of the tweets were included in the file created by the tweets to Geo code you have in section 7. Furthermore, when I ran these coordinates, they all corresponded to random locations around the world (Antarctica. the coast of Equatorial Guinea) – locations that are unlikely to be where the tweet was actually sent from. Thanks again, for all of your help. You have provided a novice like me with a lot of insight. Marco, I see that you have already responded to a very similar question. Apologies for the time wasting. Cheers Michael, no worries, it’s good to have feedback from reader. Regarding the number of tweets with coordinates, it’s always small compared to all the tweets you collect, as users have to actively opt in to share their location. With 100 Mb you’ll have approx 25k tweets, so I’d expect to see more than 10 tweets with coordinates, yet this happens on occasions with small data sets. Hey Marco… can’t believe I made it up to this point following your examples… When I first saw this blog I thought there is no way I can get all this stuff to work… and Although I haven’t managed to get all of it working 100%, I’ve still managed to learn tons in just 1 week… thanks to your simple and clear explanations, and some of the user comments. Thank you! 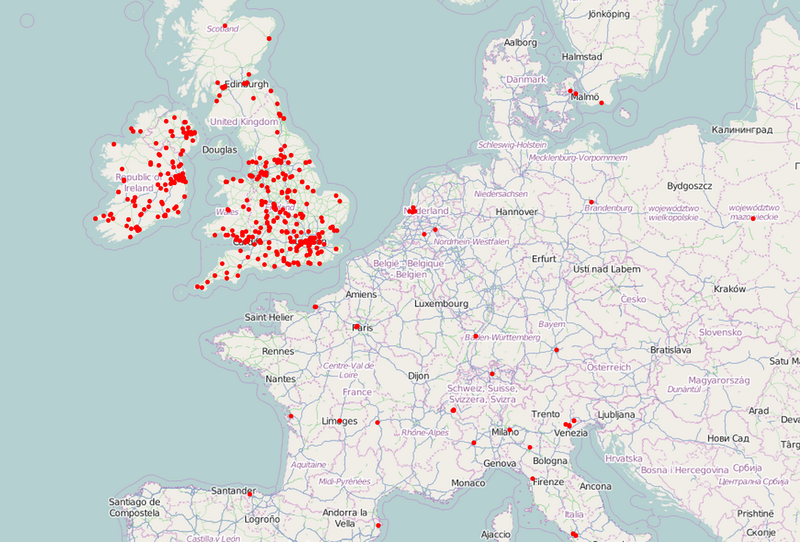 About the coordinates field being null, is there a way to map tweets on a map based on the user’s location settings? I know this will be far from accurate but should still be useful. Do you have any solution to make a heat map with lat and long? You can the see the code here, so you can get a better idea. Go to above link in chrome browser. Right click on web page and choose view source. You will see the source code. Which I can’t seem to shake, any ideas? for some reason your tweet object is a list rather than a dictionary. The data file is expected to have one tweet per line in json format, with no empty lines. In this way json.loads() can load up the tweet dictionary. So possibly some data integrity problem? This is an amazing tutorial. I have completed my work within a week with the help of this tutorial. Thank for making it simple and clear. I just wanted to know, how can I extend this example further. Please give me some suggestion. Thank you for your great tutorials and book. Thank you Marco, that is the problem. In fact in a 2000 tweets file only 6 has the “coordinates” attribute. This is an excellent and straightforward tutorial. Very good job, thanks a lot. This book is so useful and exciting !! Thanx. Any hint about why Python raises this error ?